Falling property prices generally result in fewer new home sales, but a pick-up in spending on renovations, repairs and maintenance. Similarly, in the automotive industry, tightening consumer belts and a drop in vehicle sales is likely to be accompanied by an uptick in spending on mechanical services, parts and accessories. Basically, whether it is the house or the car, we make what we have last longer with minimal outlay. GUD Holdings (ASX:GUD), a major player in the automotive parts space, is one such business, and as evident from the group’s result for the six months to December 31, 2018 that this area of its businesses is really cranking. 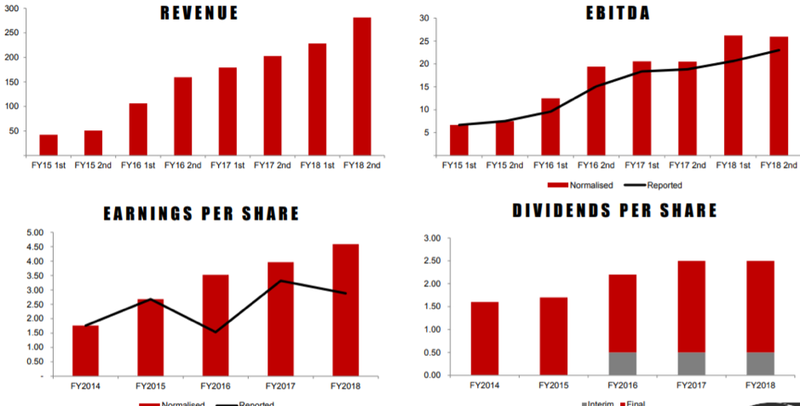 Not only is the automotive division delivering strong revenue and earnings growth, the margins are also robust with underlying earnings before interest and tax (EBIT) from continuing operations up 10% to $43.9 million in the first half, driven by $220 million in sales. GUD has been busy on the acquisition front, and of the overall sales growth of 18% for the half year, 13% was attributable to businesses acquired by the group. These included Disc Brakes Australia (DBA) and AA Gaskets. Similarly, a number of the companies we examine below have generated growth through acquisitions, boosting brand power and client bases, as well as providing the scale required to drive down costs and improve efficiencies. GUD has a long established position in the ‘wearing parts’ segment with household names such as Ryco and Wesfil. These have been perennial outperformers, and it is difficult to see the landscape changing given that they are a non-discretionary item of expenditure for the vehicle owner. The same can be said for the newly acquired DBA given that its products cover the braking equipment area. 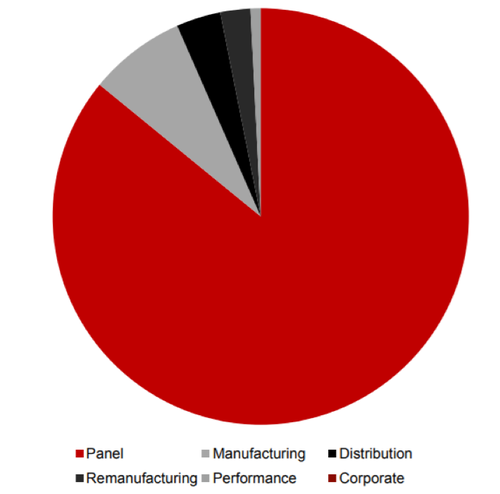 Relatively new developments that should drive growth in 2018-19 are the release of new parts, entry into new export markets, the impact of being appointed as a distributor for Phillips automotive lighting and the execution of an exclusive distribution agreement in relation to AA Gaskets products with Bapcor Ltd (ASX:BAP), a major automotive retailer. However, while GUD is a $1 billion plus company — today’s trio of stocks are less well-known with market capitalisations ranging between $40 million and $520 million. The companies we’re examine today provide a broad range of exposure to various automotive and mechanical parts industries, including one high-flyer in a niche market that has flown under the radar despite delivering excellent shareholder returns. Also of importance is the fact that we will be looking at companies that generate revenues from regular inspection and maintenance, rather than just repair and replacement. This can be a lucrative area where there are high barriers to entry as mandated inspection and maintenance is usually governed by a regulatory body, and there are strict guidelines regarding companies that service the industry. This usually results in a less competitive environment and better pricing power for the service provider. AMA Group Ltd (ASX:AMA) has led the way in the consolidation of the vehicle panel repair industry, while also building its position in vehicle protection products such as alloy bull bars, four-wheel-drive accessories and automotive electrical components. For the best part, this positions it as a leading player in the automotive after-care and accessories market, which as we mentioned earlier is important as these are mainly non-discretionary areas of spending. If a car is involved in an accident and requires panel/mechanical repairs, it is generally the case that it’s essential to have work done. The emergence of AMA in the panel repair industry has been an interesting journey and one that has been highly lucrative. Traditionally a cottage style industry where generational change has seen businesses passed on through families or from one small operator to the next, AMA has shaken up the industry with all the benefits that come from scale, including reduced costs, centralised administration and increased buying power. 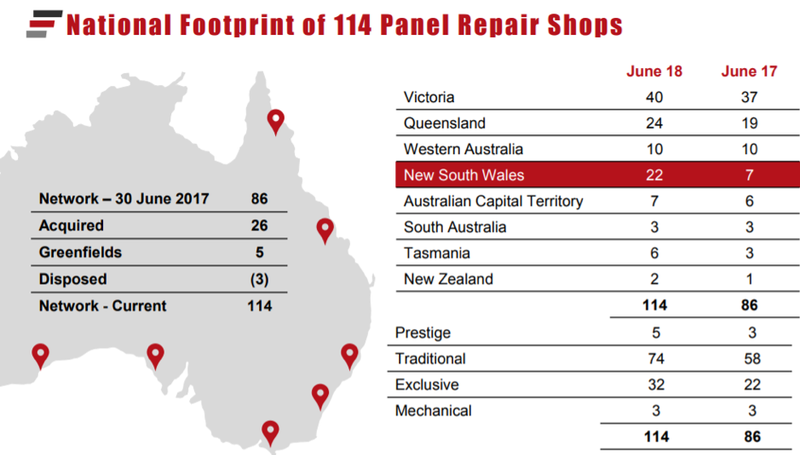 Management expects the Australian market to mirror that of the US where small panel repair shops have reduced by 26% over the last decade. By comparison, the revenue share being generated by US multi-shop operators (MSO) has increased from 9% to 28%, while small operator income has fallen from 91% to 72%. UBS global research estimates that MSO’s will continue to increase their market share to 31% by 2021. The company has established strong relationships with insurers, and referral business accounts for a large proportion of revenues. This is a competitive advantage as not all panel beaters are on insurance companies’ approved lists. In bolstering the panel repair business through acquisitions, AMA has targeted those with strong brand names and established client bases. 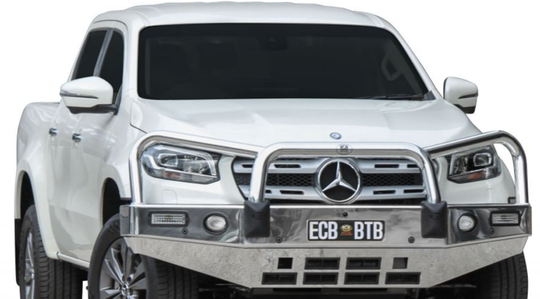 AMA also has brand power working in its favour in the vehicle protection market with its East Coast Bullbars the market leader in alloy frontal protection equipment for 4WD’s, SUVs, passenger and light commercial vehicles. Such is the strength and reputation of the brand that it is sought after by export markets, and this accounts for a reasonable proportion of revenues generated by the division. AMA has led the way in the broader vehicle protection market over a 38 year period in an industry increasingly focused on technology and quality. This has made it much more than a manufacturer and distributor of products such as bullbars. Today, it is a leader in the field of professional vehicle fit-out accessories and a recognised supplier of first choice to the original equipment, commercial service and special vehicle sectors. It is important to understand that AMA generates revenues from a diverse range of sectors, providing it with multiple income streams from areas such as mining, transport logistics and marine industries. We discussed the likely trend towards maintaining and repairing older vehicle rather than investing in new cars at a time when consumer spending is tightening. This is exactly the market that AMA’s FluidDrive division is pitched at. The group was established over 50 years ago and is well-known and respected as a specialist in the automotive industry for building remanufactured transmissions. FluidDrive supports a number of original equipment manufacturing (OEM) companies in Australia, New Zealand and Asia in supplying their dealerships with not only the latest model transmissions, but models to suit vehicles dating back to the 1990's. However, the success of the group’s panel repair business is vital in terms of its revenue contribution and potential to generate growth given the potential for further industry consolidation. The following indicates fiscal 2018 panel repair revenues made up 85.8%. This is only slightly lower than in 2017 when they accounted for 86.3%. As can be seen below, AMA has a strong track record of growing revenues, earnings and dividends, and this looks set to continue in the near term. The company’s past performance and its growth prospects have prompted brokers to be bullish on the stock, and its 12 month consensus price target of $1.32 suggests there could be upside of approximately 35% to its current price. In the coming weeks the company will deliver its results for the six months to December 31, 2018, a potential share price catalyst. PTB Group Ltd (ASX:PTB) is a vertically integrated group, servicing the aviation industry with a particular focus on the provision, maintenance, repair and financing of turbine engines and their components. Earnings predictability stems from long-term engine management contracts that provide customers with a guaranteed efficient, expert, and timely service for all their engine and component needs. This is a niche market with high barriers to entry given the level of expertise required to provide these services. The company’s business model works well for aircraft owners as it provides significant commercial benefits as cashflow is matched to operational activity. As the company meticulously tracks trading in spare parts for engines and components of its key turbine engines (PT6A and TPE331), it is able to provide customers with affordable options in terms of maintenance and repair. While the International Air Parts business (IAP) generated a solid profit of $1.4 million in fiscal 2018, the introduction of new product lines is expected to see an even better result in 2019, and this may be an area to monitor in February when the company delivers its interim result. PTB also generates income from short and long-term rental, leasing and finance of aircraft, turbine engines, and turbine engine components. The group’s division responsible for all rental and leasing activities is Pacific Turbine Leasing. Increasing PTB’s fleet of freight and passenger aircraft, as well as its large number of lease and rental engines is a key growth strategy. On this note, it was only last month that PTB purchased a package of four leased aircraft, all under existing lease arrangements. Consequently, the leases will be immediately cash flow positive, providing ongoing profits for the division and the potential to cross sell its other products. Contracts in Pacific Turbine Leasing are typically long term in nature, with high retention rates, offering consistent and predictable earnings. Management has flagged the prospect of increased deal frequency in fiscal 2019, suggesting that there could be an uptick in positive news flow over the coming six months and into fiscal 2020. The company launched Pacific Turbine USA in the second half of 2016, and as it grows in scale the division should begin to make a material contribution to earnings as it is based on the group’s Australian business model. PTB will be announcing its half-year result in February, but it has provided recent guidance, suggesting there should be some certainty surrounding its earnings performance for that period. Management is forecasting a pre-tax profit in a range between $2.7 million and $3.0 million, representing substantial growth on the previous corresponding period when the company achieved a pre-tax profit of approximately $1.9 million. Management also provided full-year mid-range pre-tax profit guidance of $5.3 million, representing year-on-year growth of more than 20%. The company’s shares have surged more than 15% since the start of January, suggesting that investors have warmed to the stock since the guidance was provided. This may well be the case as PTB tends to fly under the radar, despite management having traditionally under-promised and outperformed, consistently delivering robust profits over the last five years. 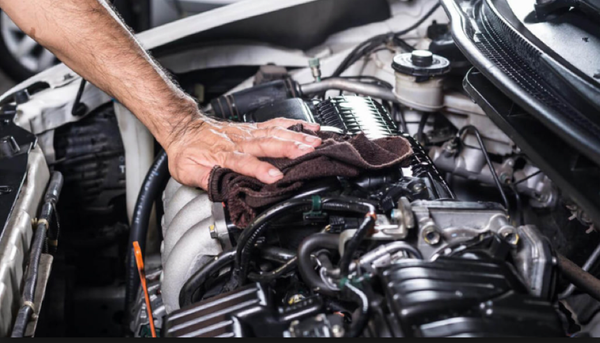 While PWR Holdings Ltd (ASX:PWH) is well known for its involvement in the high-stakes car racing industry, its expertise in making motor vehicles and heavy machinery run effectively in varying conditions has provided it with a ready market in in other areas. For example, the company designs and manufactures components for SUVs and traditional vehicles that require specialised machinery, and it is even involved in the design and manufacture of military components to suit varying areas of operation. In March 2015, PWR acquired US-based C&R to strategically expand its footprint and gain further traction in the US market. Founded by Chris Paulsen in 1988, C&R is a widely known cooling products manufacturer and fabrication business that services US race markets including NASCAR, IndyCar, NHRA drag racing and IMSA sports cars. However, just as an IndyCar needs different parts and certain tweaking depending on the race conditions, the SUV designed and manufactured in North America won’t cross the Nullarbor with standard cooling systems. 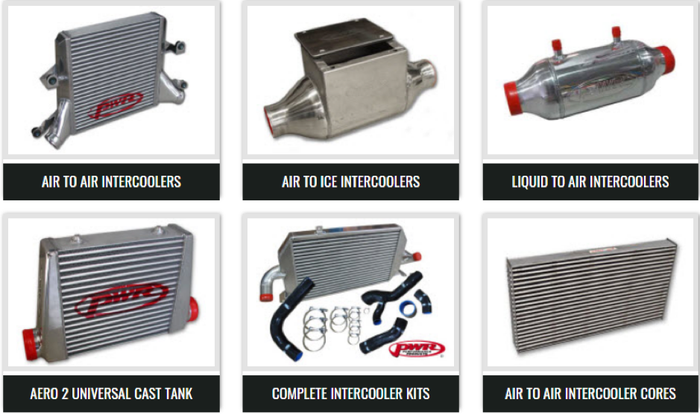 PWR has specialised in supplying the Australian automotive aftermarket with radiators, engine oil coolers, transmission oil coolers, intercoolers and a range of accessories since the company started operations more than 30 years ago. The company has built up a large range of OEM replacement stock parts covering all the best known makes like Holden, Ford, Toyota, Mazda and Honda, as well as premium brands like BMW, Porsche and Lotus. PWR also provides a range of intercooler exchange cores where the consumer can upgrade to a superior intercooler core that is fitted to the existing tanks, significantly driving down costs. Similarly the company offers an exchange service where you can run an OEM identical complete intercooler whilst an exchange unit is being manufactured. Consequently, the high octane PWR even has something to offer the more frugal motorist. Analysts are keen on PWR with Morgans noting earlier this month that the company was due to release its interim result on February 25. The broker is forecasting a 23% lift in first half EBITDA to $5.5 million driven by further growth in motorsports, emerging technologies and benefits from OEM contracts. Morgans suggested there could be news regarding contracts that have been in the discussions stages, and this could be a share price catalyst. The broker has a price target of $4.25 on the stock, a premium of about 20% to its current price. Bell Potter also likes the stock, and it is a little more bullish with its price target set at $4.50. The broker is expecting a net profit of $14.3 million in fiscal 2019, representing earnings per share of 14.3 cents. Over the next two years Bell Potter is forecasting earnings per share to increase 50% with the company consistently delivering quality returns on equity (ROE) in the vicinity of 30%.